Keep your pets, passengers, and yourself safe with the Vehicle Pet Barrier. This vehicle barrier adjusts to fit all mini-vans, SUVs, crossover SUVs, and station wagons with no tools required for installation. 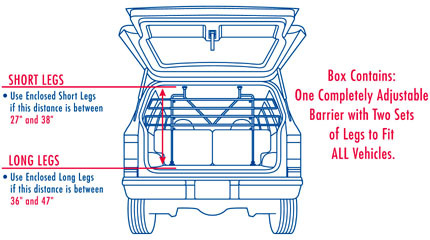 The Vehicle Pet Barrier keeps your pets safe and comfortable in the cargo area of your vehicle while protecting the upholstery and interior of your vehicle.